The police were then phoned. "He is our hero", one classmate said. Italy's Ansa news agency reports that Ramy made the call while pretending to pray in Arabic - but was in fact issuing a warning to his father. 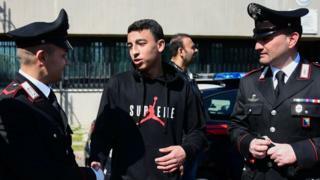 His father told Ansa that the family came from Egypt, and Ramy was born in 2005 in Italy - but has never been issued official citizenship documentation. "My son did his duty, it would be nice if he got Italian citizenship now," he told the news agency. "We would love to stay in this country. When I met him yesterday I hugged him hard." Italy's La Reppublica newspaper reports that all the hammers to break glass had been deliberately removed from the vehicle. Italy's government has taken a hard-line stance against migration from northern Africa, curtailing search and rescue operations - which humanitarian groups say endangers lives. Interior Minister Matteo Salvini, a key architect of that policy, has referred to the suspect as "a Senegalese with Italian citizenship" rather than calling him an Italian.